Jose Antonio Barrio has announced a strong squad to take on Scotland tomorrow (20th January, KO 12:30 CET, at the Central in Madrid) for what he sees as a crucial game for Spanish World Cup qualification. This has now become a regular fixture, introduced shortly after Share Munro took over the reigns in Scotland as a replacement for what had been Scotland’s traditional warm-up against the British Army. Munro wanted a stronger challenge for his team, a desire matched by the Spanish. Since November 2015 the teams have met four times – plus one game abandoned due to snow last year (needless to say, in Glasgow). Current World Rugby Rankings reflect how close the teams are. Spain sit in ninth place, with 72.77 points while Scotland is 11th with 69.89. And it is that narrow gap that Spain are keen to maintain, just in case World Rugby should decide to take the rankings into account for the 2021 World Cup. 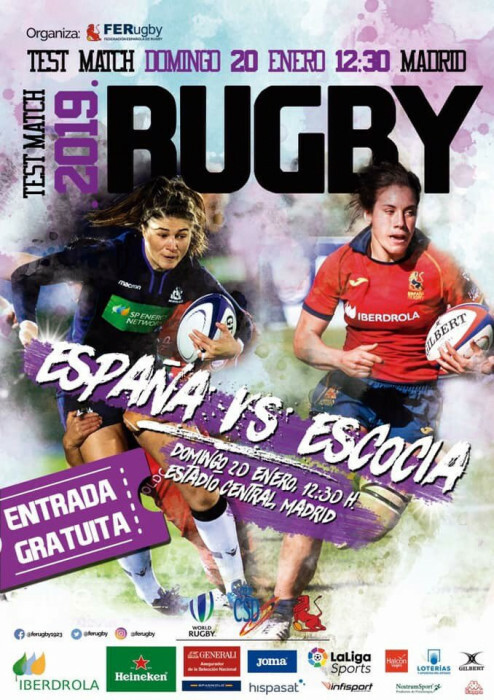 A home game against Six Nations opposition is a rarity for Spain and is being used to promote rugby with a "Lionesses Festival" starting two hours before the game with junior players of all ages taking part, supported by current and former Spanish internationals. The build-up has not been without problems, however with Isabel Rico, Paula Medín and Maria Ahis, originally called-up, unable to take part due to injuries. Anne Fernandez de Corres will captain the team for the first time. Details about the Scotland squad will appear later today.